Gone are the days of painstakingly chipping away at a chunk of green styrofoam or gluing layer upon layer of cardboard together to create the perfect topographical map for your final science project. Now, students at UCLA can use a high-tech sandbox to recreate topographical maps and simulate how erosion and weather events change landscapes over time. 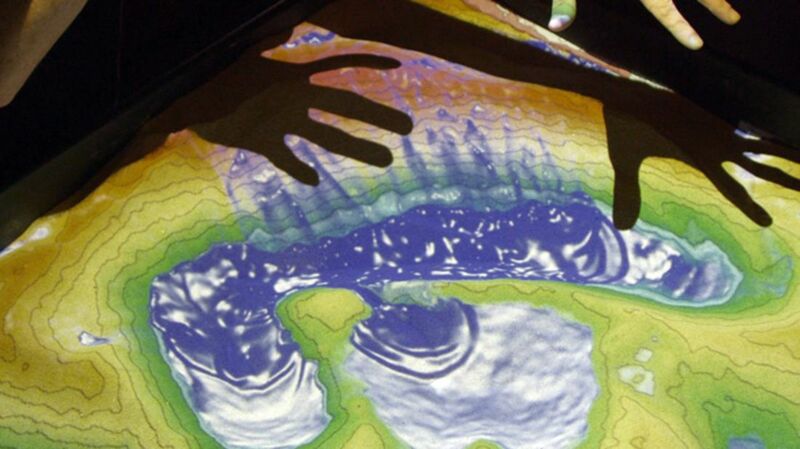 According to a UCLA news announcement, the technology for the Augmented Reality Sandbox (as the fancy toy—ahem, research tool—is called) was first developed by researchers at the University of California, Davis. UCLA’s version was built by a team headed by Gary Glesener, director of UCLA’s Modeling and Educational Demonstrations Laboratory. Glesener and his team started with an actual playground sandbox. This sandbox was then connected to an Xbox Kinect sensor, which picks up any changes students make to the sand as they create their mountains and valleys. The changes are processed with open source software and projected in pretty colors onto the sandbox below. In addition to sculpting the sand into geographical formations, students can also hover their hands over the box to make it rain in designated areas.